This might be a nice diagram to illustrate the way one reaches a glass ceiling. The figures show that I rank number seven in the world by number of contributed (& accepted) papers in the Social Science Research Network, a massive multi-area repository of academic works. Though perhaps I shoudn't be saying this, as it might reflect on my reputation (or on my reputation for readability) I do not rank anywhere near this position if we consider more "relevant" parameters, such as number of downloads —the ranking by number of downloads or, ahem, "readings", being arguably the closest equivalent to one's real academic weight or influence or current prominence. Looking at the graph, it would be hard to deny that position number seven is, for the time being at least, my natural niche and one that was in a way carved out in advance for me. 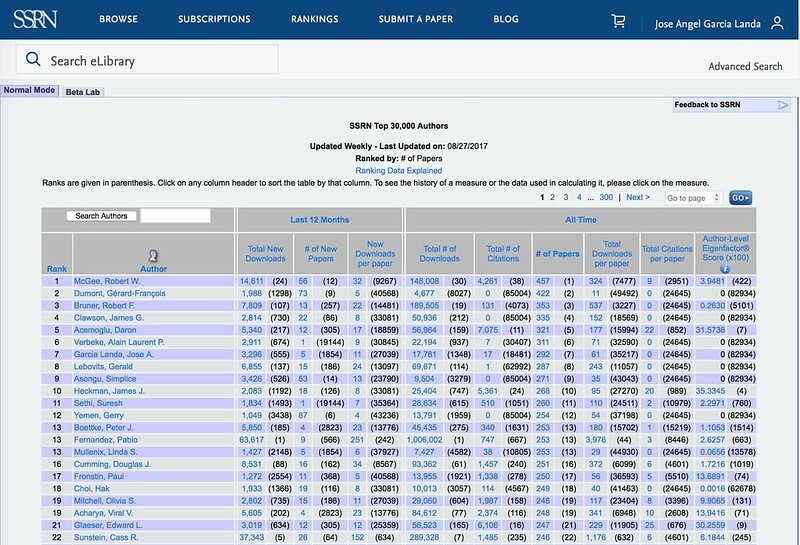 Note that although there are more than 300,000 academics who have uploaded papers to the SSRN, the ranking statistics only take into account the top 30,000 authors by download count. That is, it's no use uploading (and getting the section editors to accept) many papers if nobody consults them. Let me acknowledge straight away that achieving a good position in the SSRN requires not just a dose of academic stamina, but also the patience and dedication to upload one's work to the server—something which plainly enough most academics in the world, arguably including the 30,000 most relevant ones, have not systematically done. All rankings require a bit of an effort in order to reach a visible position in them, or perhaps rather two different kinds of efforts. 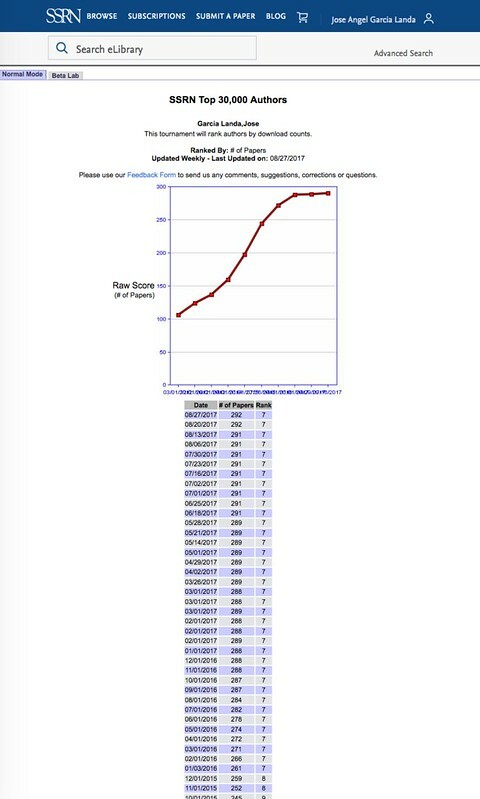 Be as it may, I reached my highest ranking in the SSRN (in this specific "tournament" as they call it), #7 by number of papers, in early 2016. Given the shape of the graph, it is unlikely that I will ever make it to number six or beyond. But there's reason for hope in one sense—I rank World #1348 by number of downloads, but a mere #555 by number of new downloads, taking into account the only the figures for the last year. This is a podium with many steps. Here is the latest ranking of the SSRN authors: I hope I may be excused if I privilege my own favourite parameter in the presentation of the data, but the overall figures can be easily read here too. Pablo Fernández, an economist from the University of Navarre, who ranks #13 by number of papers, ranks an absolute number one by overall downloads—whether new or old downloads. There's no likelihood that he will improve that position, either. But when your only way to move is down there doesn't seem to be any reason to complain. Some academic rankings are taken very seriously by our politicians, journalists, professors and students alike. It reflects sadly on the Spanish university system, but not necessarily on Pablo Fernández or on myself specifically, that no Spanish universities are found among the top 200 universities in the world in any of the main rankings. I won't deny there's room for improvement there. But rankings come in many shapes; actually, the celebrated Shanghai ranking which systematically leaves our universities out does not even include a section for the humanities (no philology, history, law, philosophy, art or cultural studies there). Which leaves me somewhat skeptical about its relevance for my work, and vice versa. At least the SSRN does include the humanities as a sub-section of the social sciences. So I thought I might vent some better news, about this alternative world ranking, with a Spanish academic on top of the list—and including quite good news for me as well. Although I may never make it to number 6 in "this tournament", I did what I could so help me God—and I have done.